Knit to the position of the buttonhole and cast off the number of stitches required, depending on the size of the buttonhole and the thickness of the yarn. Work to the end of the row. 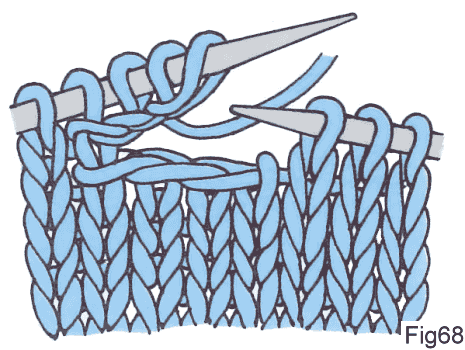 On the next row, work back to the cast off stitches, turn and cast on the same number of stitches using the cable method, turn and work to the end of the row (Fig.68). On the next row, pick up the loose thread at the start of the buttonhole, work the next stitch, and then pass the picked-up stitch over. 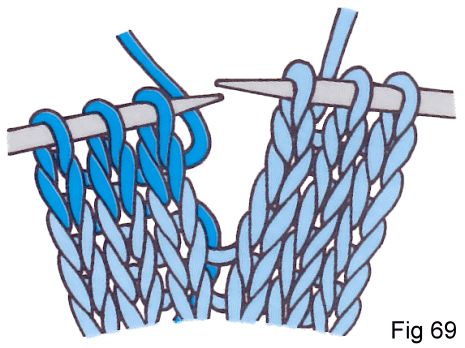 Divide the stitches at the position of the buttonhole and work an equal number of rows on each set of stitches, then join up with a row of knitting worked right across (Fig.69). An easy way of making a small buttonhole is by the eyelet method as described here. This gives a small round hole, which is ideal for babies or children’s garments.